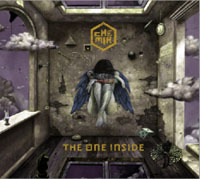 Share the post "Album review: CHEMIA – The One Inside"
Poland is something of a hotbed for progressive rock, it is therefore somewhat surprising when you hear an absolutely cracking album from a Polish band which sounds like it could have been conceived in a smoky studio in Seattle. The album was in fact recorded in Canada so maybe that country has provided a breath of fresh – if a tad Nickelback infused – air. Arriving unannounced sans press release from what we can make out Chemia formed in Warsaw in 2010 and this is their second album. From the opener ‘Ego’ this is a rollercoaster ride of great songs, razor-sharp riffery, and some great vocals. Lukasz Drapala who joined the band in 2011 would certainly give Myles Kennedy a run for his Zloty. The band are evidently influenced by classic rockers but their resulting sound owes much to the Alter Bridge/Bush/Audioslave school of post-grunge commercial rock. However, to my ears, they sound a whole lot fresher and slightly less calculated so don’t let those comparisons put you off. This entry was posted in ALBUM REVIEWS, ALBUM REVIEWS (Mobile), All Posts and tagged album, alt rock, alternative, Chemia, Poland, review, rock, The One Inside. Bookmark the permalink.